I love sweet tea. Well, even after three years of living in South Carolina- where sweet tea runs in the veins of many- I can't get into the syrupy sweetness of full "sweet" Sweet Tea, so I order my "sweet tea" half and half. That would be a glass of half unsweetened tea and half sweetened tea. I recently bought myself an iced tea maker so that I can make my own iced tea to my own sweet liking. 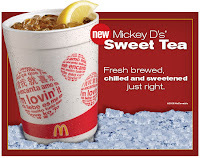 If I'm out and want to purchase a sweet tea, though, my favorite place to get it is at McDonald's. For only a dollar you walk away with a cup large enough to burst your bladder. Yesterday things went terribly wrong with my sweet tea. Now, there is lots of scientific research money at work concerning perfection and the ratios of sugared tea to non sugared tea. I poured my own half tea and then half sweet tea, so I could have the exact ratio. I slapped on the lid, bit the wrapper off my straw, inserted the straw and headed for the table. I had a sip and got only unsweetened tea. So, I discreetly blew bubbles into my straw to "mix" the sweet tea (on top) with the unsweetened tea (on the bottom). (Ratio... ratio... ratio.) (Don't laugh about blowing bubbles in my drink. The kids didn't see me and it works!) I sampled again. No sweet anywhere. I sent my son to the drink counter to add in some sweet tea. I sipped again. Okay there is no sweet in the sweet tea. I approach the counter. I notify the pregnant employee that there isn't any sugar in the sweet tea. (I always feel sorry for pregnant people working at stand up jobs. I told her I would go home and put my feet up just for her, but I digress.) She offers me sugar. Now, I don't mean to be rude, but doesn't everybody know that you can't add sugar after the ice? You get a crusty bottom and limited sweetness. Not to mention, a sandy texture going up your straw. Oh, you have to be so careful with the ratio... No, thank you, I don't want sugar. She offers to fill my glass from the drive thru's sweet tea jug. That would be fine. Thank you. She hands me back a full glass of tea and I put the lid on and head out the door. On the way home I am buckeled and safe and I take a long swig from my tea. You know what she did, don't you? She poured out all my unsweetened tea and filled it to the brim with sweet tea! Ugh! I really had no point in telling you this. I just want you to feel sorry for me because I didn't get any tea yesterday! Technically, I've posted this recipe before, but it is just that good, friends! 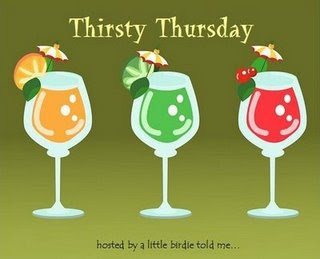 Hmmhmm and it is Thursday and I want to participate in Thirsty Thursday over at Ryann's blog. So brew up some tea and thank me later! Make tea using 12 cups of water and 9 tea bags. Stir in 1 1/2 cups (more or less) of sugar. Let cool and add 1 12 ounce can of lemonade concentrate and 1 12 ounce can of pineapple orange juice concentrate. Makes a gallon or so. Stick an umbrella in it and leave me a comment! Our family is really trying to be more health conscious. This morning my sister in law and I were discussing different (positive) changes we've made. Like many of you, we have switched to 1% milk (just can't do the skim, but 1% is good) and lower fat dairy products, we are eating more fruits and veggies, and we buy whole grain breads. 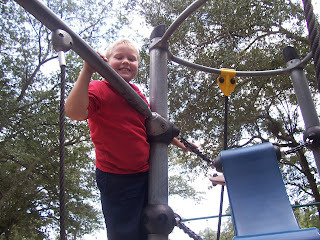 We toss the kids outside for exercise. Some of our children really want a second helping, whatever it is. Knowing that they are going to ask for a second helping, make the first helping smaller, sometimes a lot smaller. Use a kid/small plate. I do use divided cafeteria trays, but it is easy to overfill these. We try not to "drink calories". I try to only serve water or milk as beverages. The kids love to fill up their own water glass from the fridge door on their way to the dinner table. Even though milk and juice have nutritional value, once those nutritional needs are met for the day they are just drinking empty calories (for the most part...). Bellies are more full from a yogurt or apple than a glass of milk or apple juice. Leave a comment and let me know what healthy changes you have made. Got a toe ring! 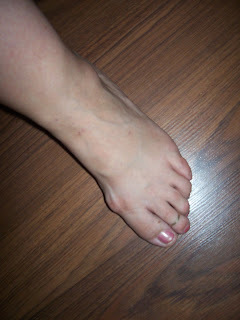 I know, I know, why in the world would you want to put a ring on an ugly toe, but for some odd reason I couldn't resist. 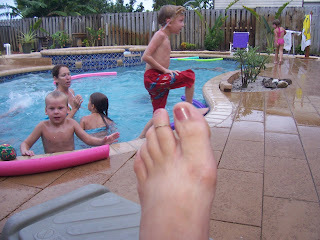 Do you think toe rings lead to tatoos? 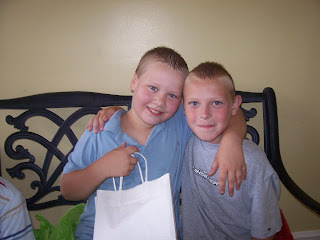 I found a little bit of blogging fun over at A Little Birdie Told Me. Ryann hosts a carnival called, Thirsty Thursday. Simple enough, I figured... just share a drink recipe. So here goes. Bust open a bag of chips with salsa, leave a comment and then head on over to A Little Birdie Told Me for a yummy pumpkin latte recipe. Just like Starbucks, I hear. Mix the drink mix, water, orange juice, lime juice and tequila (maybe...) in the blender. Add in the ice and blend until slushy consistency of your dreams. Makes 4 or 5 drinks. Back to that peace I enjoy. You can get it with a deck of cards! That is right. I've taught the boys to play Go Fish! and Garbage and we (all the boys and at least one adult) can enjoy a game together. They aren't quite ready to play alone yet, but if I can play with them they are happy and cooperative little card sharks. And, folks, let me remind you that cards are so portable. That deck has given us some fun times at the beach, the park, waiting for supper, and even while waiting way too long to see the doctor. Leave a comment and I'd love to hear about any card games that your kiddos enjoy. Perhaps one of the positive aspects of my brother's untimely death is that I am paying more attention to my diet and exercise habits. I think I have functioning from under a bit of an ignorance cave about my own heart health and genetic disposition to bad heart health. Let's face it. I've known it all along. Every member of my family whose ever died, has died from a heart attack. But I'm too young for that. I have too much estrogen surging through my veins for that. I eat too many donuts to outlive that. 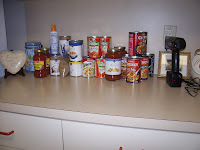 A few weeks ago, when I was stocking up for Hurricane Ike, I bought a few soups for myself. Soup can be a filling and flavorful meal for little calories and fat. I noticed that Campbell's has a new line of soups- Select Harvest, that are just what I was looking for! I chose the caramelized French onion variety. I love French onion soup. What isn't to love... all those simmered onions, rich beef broth, a blanket of bubbly white, cheese, and a large crouton? Now, I know the low-cal soup wasn't going to have the bit of bread or all that gooey cheese, but I was looking forward to the beef and onion-y richness. And I was disappointed. It had an odd flavor. I'm not sure what the deal was, but I couldn't eat it. It was full of onions and the broth was a deep, clear brown, but I didn't like the flavor. Sorry. I'm hoping the other flavors are better! Look here to see all the flavors. Give 'em a try and let me know which one I should try next! 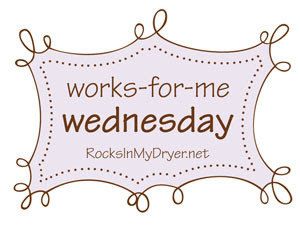 And head on over to Mrs. Who's blog to see what other people have given a try this week. Today A received a card from a buddy in South Carolina. A misses his friend and he sure is glad that B prays for him. 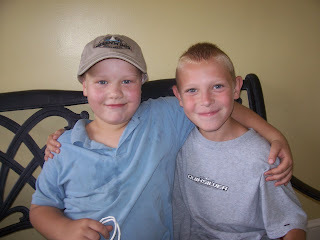 Here are two pictures from the last time these boys were together. B had given A this cool South Carolina cap that he loves. Check your mailbox soon, B and have a good birthday! So there I was in the pediatrician's office. All three boys. Sanity lost, I tell ya. First, we had to wait in the waiting room for an hour. In all my history of pediatricians (this move makes a 5th doctor for 8 year old A) I always have to wait an hour in the waiting room. I'm not clear why this is true, but it is. It seems to me that an office manager would be able to book appointments so that they didn't consistently overlap. She could also probably leave a few openings for those sick kids needing an appointment right now. But, hey, I am not an office manager and I have zero experience with doctors' offices. Working in them, anyway. Back to the waiting part. It was brilliant. I'm polishing my fingernails on my chest right now just remembering how prepared I was for this part. I had GameBoys and I-pods for the first part of the waiting since I knew I would be signing away any chances at a lawsuit and copying my phone number 33 times. I brought a deck of cards for when I was finished with all the paperwork. We played a few rounds of Go Fish! while waiting. I tell ya the whole waiting room was in on the Go Fish! action. I guess I'd never realized how many adults had never played the fun kids' game. In the middle of round three of the card playing they called us in the back. Now, I was preparing myself for the quick height/weight/blood pressure thing followed by another half an hour wait in the 4x4 cell. I was pleasantly surprised! The doctor spoke to me in his office while the boys were taken one by one into a 4x4 cell for the assessments. Then we moved to the exam. And the doctor was great. Anyway, this doctor could do it! He even could talk to me and answer their questions... What's this? What do you use this for? Can I have this? Do you like Spiderman or Superman? Alright, then. D gets his shot and that was cool. Cooler than anticipated. Go, Nurse! We move on to the Peeinacup. Now, A had already taken care of this. While in the waiting room he had to use the washroom, so a nurse took him back and got his sample. Done. A waits in the hallway while I take two cups and D and S into the bathroom. Deep breath. There are no labels, pens, tape, markers. Just two cups and two lids. Okay. I can handle this. D pees everywhere. Cup, shorts, toilet, floor, leg, shoes. Being the prepared mother I am I actually have another pair of his shorts in my bag. I back out the door (I didn't have it shut all the way since A was in the hallway) and ask A to hand me the spare shorts. He spies the cup in my hand and says, "Hey, Mom. It feels hot like when you bring Dad a cup of coffee, doesn't it?" Yeah, right, give me the shorts. I give D the fresh shorts, but he can't move since he is in a, well, it isn't actually a puddle of pee, but you know what I mean. I reach for paper towels. None. Fancy hand blowers. I guess people put paper towels in the toilet and we just can't have that anymore. I venture out into the hall for help, with my two cups of unlabeled pee. I'm repeating to myself, "S in the left, D in the right." The children are now miles behind me stuck in a pee mess discussing why pee is as hot as coffee while I traipse around with two cups of pee unable to find anyone to help me. Just peachy. My hair is all over the place, I have sweat on my upper lip, my left eye won't open all the way and my shirt has ridden up in the back. S in the left, D in the right. Finally. Some help. She takes paper towels and starts the cleanup. D gets changed and we make our way to the lab. S in the left, D in the right. The boys plop down while I stand holding our lab offering. S in the left, D in the right. The lab lady comes around and gets the stuff ready for sticking the boys. Can I put these down? Sure. S in the left, D in the right. Phew. I feel my blood pressure ease a bit. My left eye opens. I straighten my shirt. A has his finger stuck and then the little tube of blood filled. Not a huge deal. He does beautifully, for which I am thankful because that isn't always his style. The other two, however, quickly decide that this is the scariest thing they've ever seen and begin to protest (loudly) and run for cover. I'm pulling them from under the chairs, rubbing their backs, pushing them closer to the lab chair, lying profusely/encouraging them (it only takes a moment, you'll be okay, it only hurts a little bit, you'll live...) to no avail. I eventually wind up doing my best to restrain them while the lab lady does what it is she does. The screaming and gnashing of teeth continues. The howling and crying carries on. D moans, "Why do they need all this bloooooooood for one little testtttttttttttt?" People stop and stare. The lady who helped D fan out his cards in the waiting room stops by to console him. Children stop to show their own "war scars" and I begin to wonder how much ice cream is actually in a container of Haagan Daaz. Okay. We're done. Bedazzled in band aids we leave. The doctor's office called. 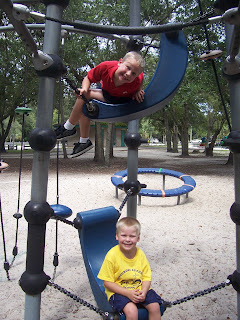 They didn't get enough blood from D.
Last week I asked you, my blogger friends, how you deal with kids and chores. Thank you for all your answers and great tips; you gave me tons of inspiration! Today I want to share what works for us! 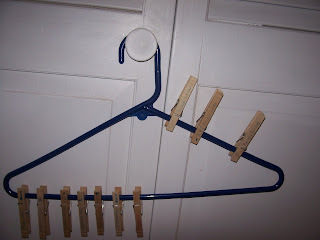 I started with a plastic clothes hanger and a bag of cheap clothespins. 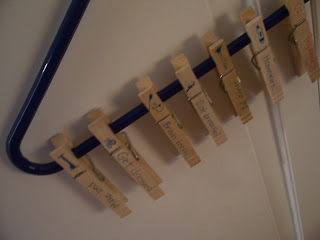 On each clothespin I wrote one of the things that has to be done as part of either Morning Routine or the Before Bed Routine. (Get dressed, brush teeth, feed cats, homework, put on pj's, etc.) I then clipped all the Morning Routine things on the top left side of the hanger and all the Before Bed Routine clips to the top right side of the hanger. As each boy completes a clothespin task he moves the clothespin to the bottom of the hanger. *One of the things we really struggle with is being cheerful rather than grumpy, whiny, disgruntled, etc. so one of the clips on both sides (Morning and Before Bed) says, "Be Cheerful." Each boy has his own hanger and I duplicated most of the clothespins for each boy, but some are unique to them. For instance, D feeds the cats, S sets the table and A empties the dish washer. I also have one clothespin that says, "Kitchen helper" and that clothespin moves from hanger to hanger. (If the kitchen helper clothespin is on your hanger than you get to help mom cook that day.) * I included a small, badly drawn doodle to help the non reader know which clothespins what for what job. They aren't paid for any of these clothespins. Now, in a mug I have a bunch of extra chores that can be done for money. Wash windows, sweep under the table, wipe down bathroom counters, bring the garbage can from the curb, sort recycling, etc. These clothespins are clipped to the outside of a mug. If A chooses a chore from the mug he does it and clips the clip to his hanger and that night I will trade his chore clothespin for a dollar sign clothespin that will stay on his hanger until Pay!! Day!! How much wampum? A dime a chore! Leave a comment and then head on over to Rocks in My Dryer to see more great tips about everything! Years ago, when I was a kindergarten teacher in Canada, I discovered that the other teachers (and a large portion of the older-than-kindy student population) loved me because of my snacks. I served snacks to my students and I would SHARE with others (mostly pregnant teachers and gawky eighth graders). When we left Canada I was even serenaded with a song written just for me where I was labeled, "The Snack Queen." I'm telling you this so you understand that I love a good snack. Take me seriously because I know a good snack when I eat it. Now, pay attention because I'm about to introduce you to my newest and favoritest snack. Pretzel crisps. 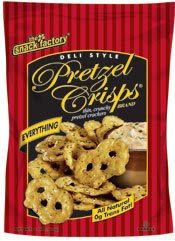 Their website (http://www.pretzelcrisps.com/) says you can drag them in dip or stack them high with cracker toppings, but I've only crunched 'em plain. The "Everything" flavor is my standard (I hesitate to say "favorite"... see below), and the boys like the Buffalo wing and mustard flavors the best. 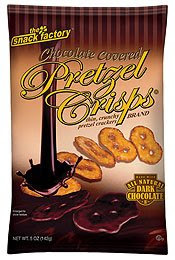 Just a word of warning: If you are not the snack-sharing-kind I suggest you get the chocolate dipped Pretzel Crisps and hide in the closet!! When you're done with your snack run on over to Mrs. Who's and see what other people have tried this Tuesday! 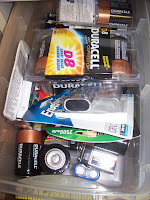 Since Ike is not coming to blow off our roof and leave us without electricity, can I offer you a can of sardines, a bottle of water or a fresh pack of C batteries?? Great. 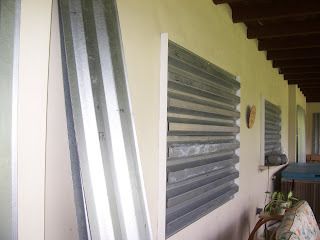 Can you help me take down the hurricane shutters? This week's Works for Me Wednesday is a bit different from the normal tip-giving fiesta over at Shannon's . Yes, this week I am asking for your best tips. Specifically, your best suggestions about kids and chores. Yeah, all that good stuff and my friend MaryLu had a terrific chore chart on her website that has motivated me. So, go ahead tell me what works for you! How do you keep track of each kid and their specific chore? Do the chores change or rotate? Gotta chore chart or chore jar that works for you? Do you praise or pay for jobs completed? How many chores do the kiddos complete? Weekly or daily list?